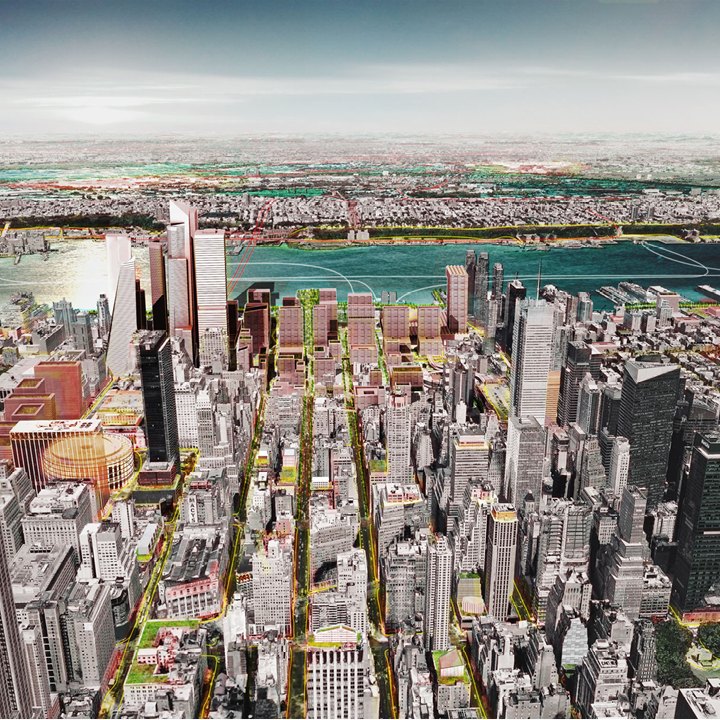 It’s 2040, and Manhattan’s Far West Side is a dynamic commercial and residential district stretching from midtown to the Hudson River and anchored by a revitalized Penn Station complex. This once remote industrial frontier of the city has been transformed. A modern mixed-use development around Penn Station provides commercial office space and amenities for workers and residents, all reachable by pedestrian walkways seamlessly integrated into Midtown. 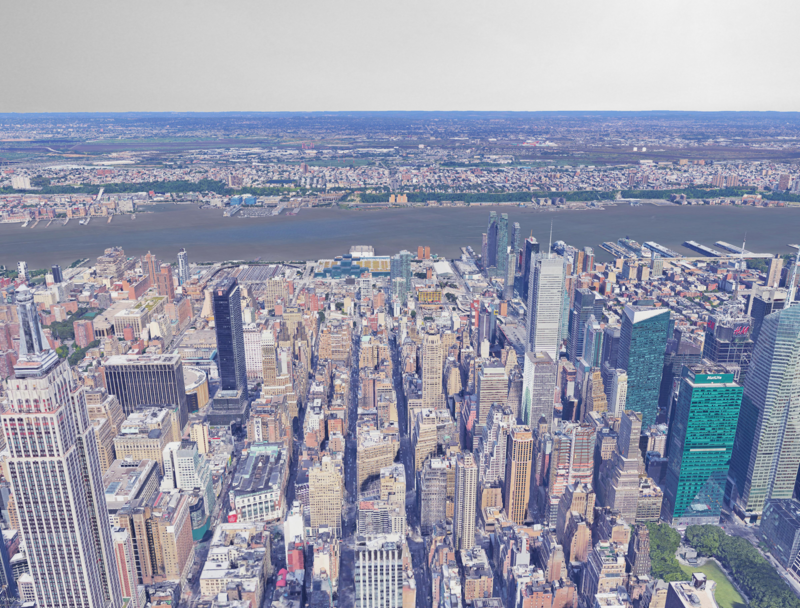 In nearby Hudson Yards, which features vibrant contemporary architecture, residents can take advantage of riverfront activities and access to all the city offers. Through preservation efforts and strict design guidelines, a diverse mix of building types and original housing stock was maintained, adding to the area’s distinctive character even with the addition of thousands of new jobs and residents. The Far West Side is not only a transportation hub, but also an integrated city landscape that serves many purposes for residents and visitors alike. For more than half a century ago, city planners struggled to formulate a cohesive vision for the Far West Side. Important investments were made, including new offices and homes over Hudson Yards and the extension of the #7 subway line. But a fundamental obstacle remained: the larger district was composed of oversized “superblocks,” and the area was disconnected from the rest of the city. Penn Station, a critical transit link for the city and the region, was aging and dysfunctional and surrounded by equally unappealing streets. The Port Authority bus terminal was deteriorating and well over capacity. Just to the north was the Garment District, home to a legacy industry but which struggled with rising rents and a changing marketplace that resulted in 1.7 million square feet of vacant floor space. The district’s failing infrastructure was either removed or redesigned, including the elevated ramps to the Port Authority Bus Terminal and the cuts for the Lincoln Tunnel approaches. A new bus terminal beneath the Javits Convention Center consolidated intercity bus service into Manhattan and reduced bus overflow onto streets, while also shortening the commute for office workers in the growing Hudson Yards district. With bus traffic reduced by nearly 30 percent, the old Port Authority Bus Terminal was refurbished with more commuter bus gates on the ground level, providing better access to subway lines and streets that were cleared of overhead ramps. A new district also took root around Penn Station. Madison Square Garden, once located above Penn Station, was relocated, with its circular steel frame repurposed to enable light and air to stream down into the station. The platforms had been freed of hundreds of columns that used to support the arena. To make the area more conducive for shopping, dining, and entertainment, many streets around the station were closed off to become pedestrian walkways, and a lively public space was created along Seventh Avenue. This is also the grand entrance to the station, which in 2040, serves some one million daily riders. New escalators and widened stairs allow commuters and travelers to easily access the station from the sidewalk. And travellers are able to make through-running trips by connecting to Amtrak’s new High-Speed Rail or a Regional Express train. Riders are now able to use new through-running service to reach destinations beyond Manhattan. A professor from Cornell Technion is in the completed Moynihan Station waiting room about to board a High-Speed Rail Amtrak train to Boston; a commuter from Queens is staying on a Regional Express train to a new job in Paterson; and a car enthusiast is sitting on a train headed for Sunnyside Yards, where the relocated Javits Convention Center is hosting the annual Zero-Carbon Driverless Car Expo. These new through-running trips are possible because of Gateway East, two new East River tubes to Sunnyside Yards, and connecting tunnels along 31st Street, which were built after the new Gateway Tunnels, as part of the Penn South project. The Garment Center was remade into a 21st century production district. The city funded the consolidation of garment manufacturing into permanently reserved space in the lower floors of the old loft factories, which now house manufacturing activities of all kinds, while startups and design firms have offices on the upper floors, along with residents. 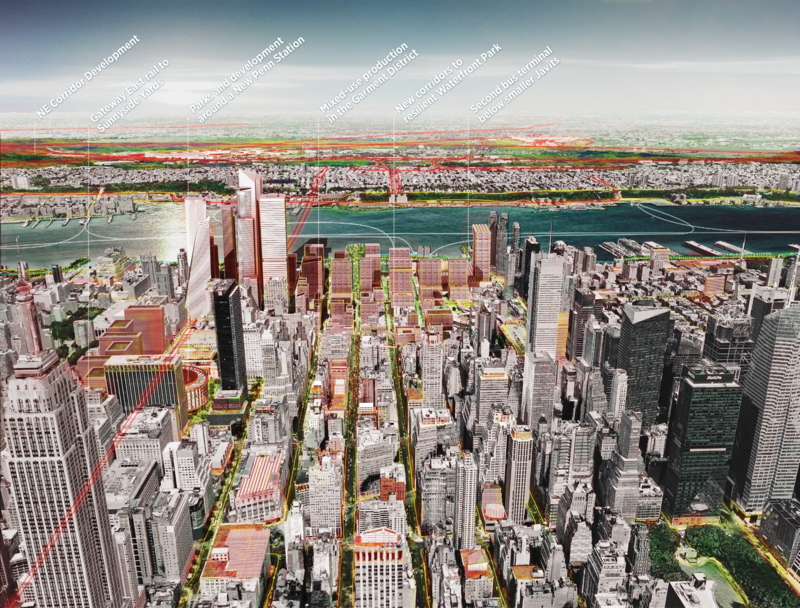 All across the Far West Side, neighborhoods and signature open spaces—the High Line, Hudson Yards, new plazas around Penn Station, and pocket parks over the Lincoln Tunnel access roads—were connected by walkable and bikeable streets. Cross streets that once blocked the Convention Center were extended to a new waterfront park, which was widened from a narrow strip of greenway to a rolling landscape that holds back the raised waters of the Hudson. At the new water’s edge are wetlands, new walls, and piers for ferry terminals and recreational activities. This transformation of the Far West Side was only possible because the agencies responsible for infrastructure and development began to collaborate, and recognized they shared a common goal of bringing prosperity and resilience to the area. A special-purpose authority delivered the new Penn Station and rail tunnels on time and on budget. Restructuring at both the Port Authority and the MTA enabled both trains and buses to operate reliably even as major construction was underway, and facilitated coordination between New York City, New York State, and New Jersey. The creation of the Far West Side showed that New York City remained committed to housing affordability and economic opportunity. It preserved existing apartment buildings and encouraged a diverse economy of manufacturing and office employers in the Garment District, while commercial office space and residential towers were built near Penn Station. New transit connections supported a reciprocal and mutually beneficial relationship between New York City and the constellation of other cities in the region, which became centers of prosperity in their own right. At the same time, the city met the challenge of climate change on the vulnerable Far West Side by building new kinds of parks and public spaces at the water’s edge, protected from sea-level rise.